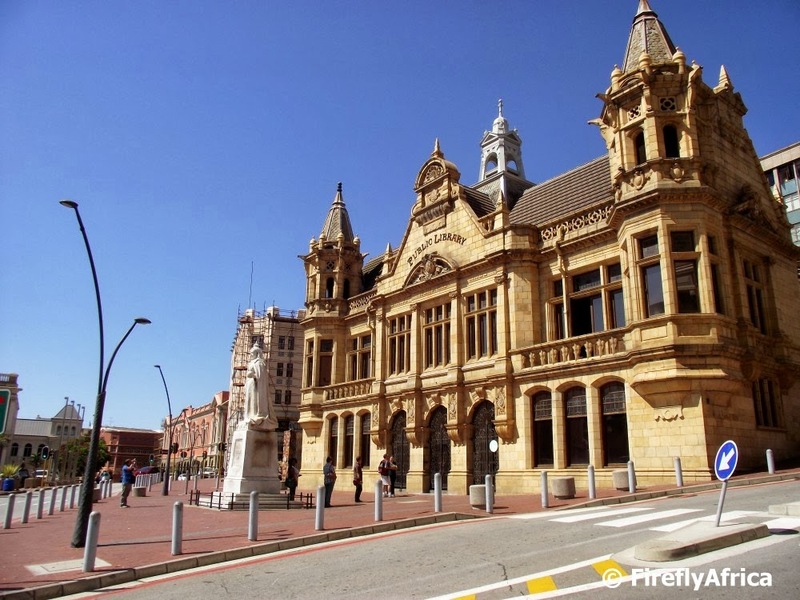 Nelson Mandela Bay, of which Port Elizabeth is part of, has a superb destination marketing video that has won two international awards. If you've never seen it its well worth watching and if you have, watch it again. If you live (or have lived) in PE this video will give you a warm fuzzy feeling inside and usually makes me want to get out and explore. This week's posts are turning into a mini Wells Estate series. Wells Estate is situated close to the Coega Harbour and standing on the end of the pier you can see the harbour with all its gantries and cranes. 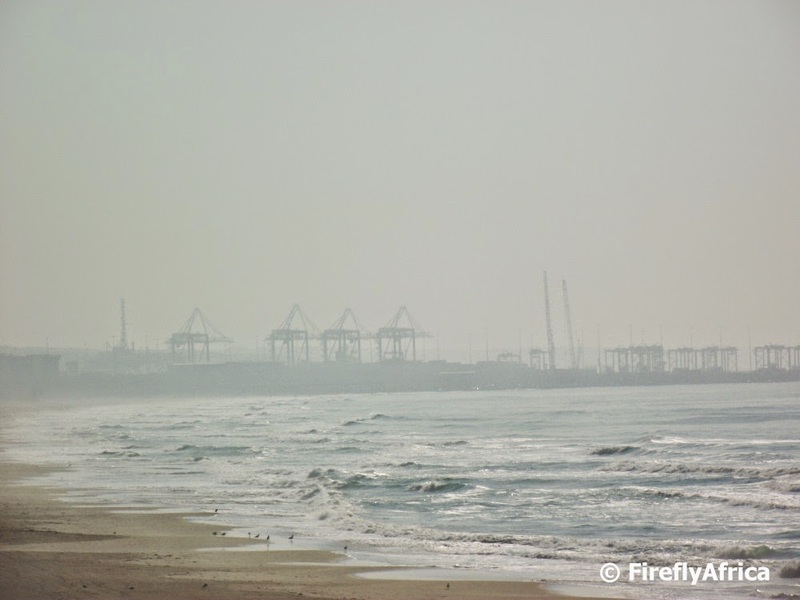 On my visit it was foggy out Coega way and the cranes looked like specters in the mist. After yesterday's post of Wells Estate Pier I decided to post another one. This time looking back along the pier from the crows nest at the end of it. 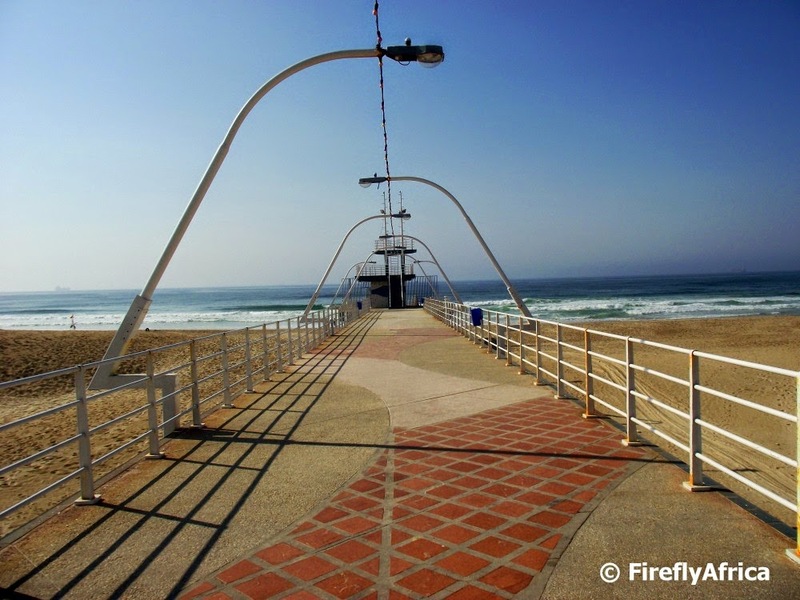 I want to bet that most PE Daily Photo readers who live in Port Elizabeth have never actually been to the Wells Estate pier. Yes, everybody knows where it is and have seen the blue buildings along the N2 just outside Bluewater Bay, but who has ever turned off to have a look. 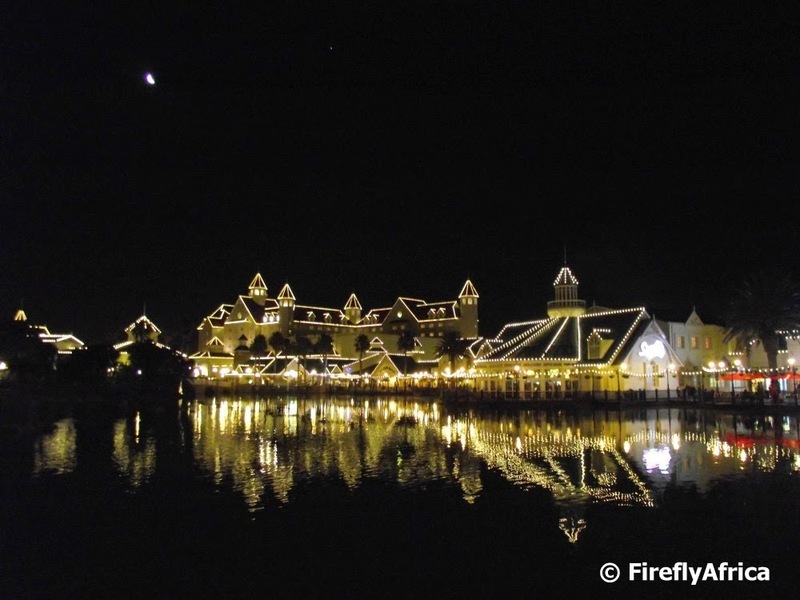 Although I've been there before I decided to stop by for some photos and took a walk along the pier to the end. This is where I took the picture of the dolphins surfing that was posted yesterday. Unlike Shark Rock Pier it doesn't go into the sea, but I don't know what else to call it then. On my way to Colchester for a meeting I had some time to play with and decided to stop at Wells Estate to snap a couple of pictures (and look for a Geocache). Standing on the end of the Wells Estate Pier I noticed a pod of dolphins swimming along the shoreline just behind the waves. Suddenly they started surfing the waves right in front of me. Now that is always a treat and even better if one has a camera on hand. On 22 April (today if you read this post on the day it got posted) we celebrate Earth Day. Earth Day is an annual event held worldwide to demonstrate support for environmental protection. 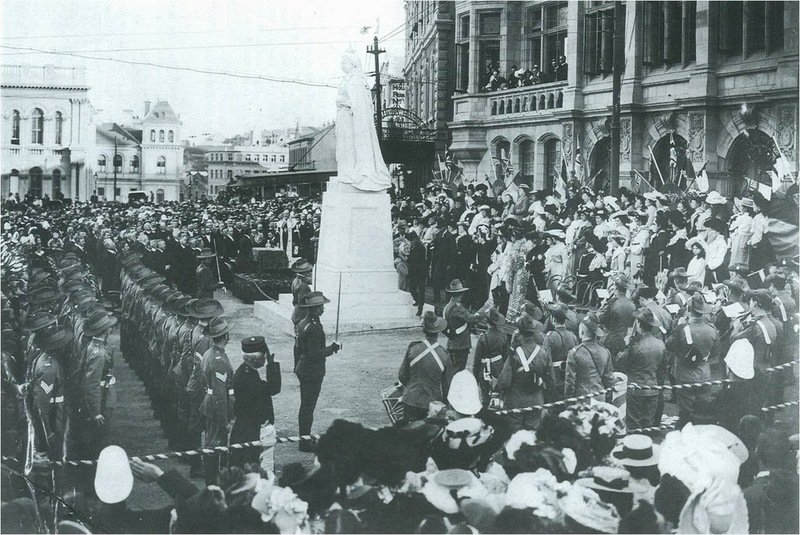 The day was first celebrated in 1970 with 192 countries now taking part each year. 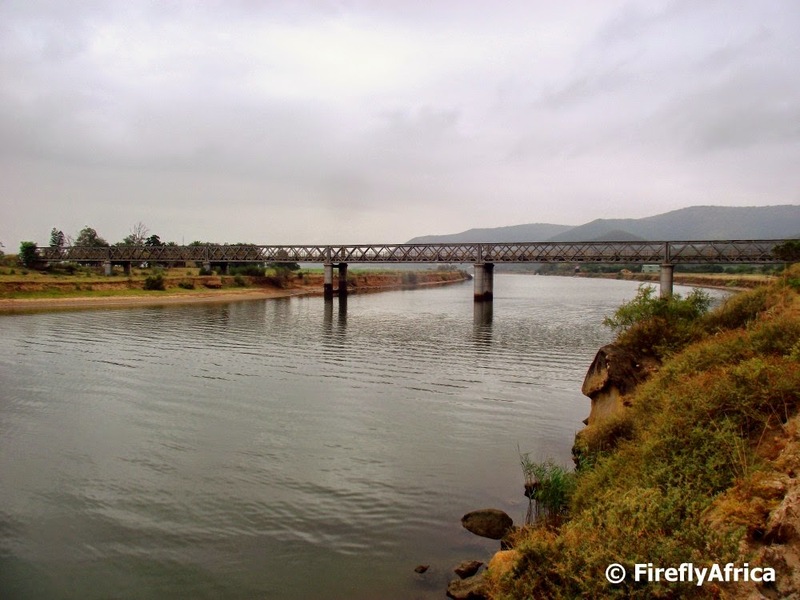 The Swartkops River is one of immense beauty and has significant enviromental importance. The origin and source of the river lies in the pristine area below the Cockscombe Mountain and the beautiful valleys and surrounding hills are seldom seen due to its inaccessibility. It is only from below the Groendal Dam that we find the problems of pollution and alien infestation occuring.The river is heavily polluted by water which empties into the Swartkops River through storm water canals,(Motherwell Canal, Markman Canal, Chatty River and the upper reaches in Uitenhage) discharging raw sewerage and many tons of litter and waste from these sources. Pollution from industry and individuals contributes to pollution in the river. 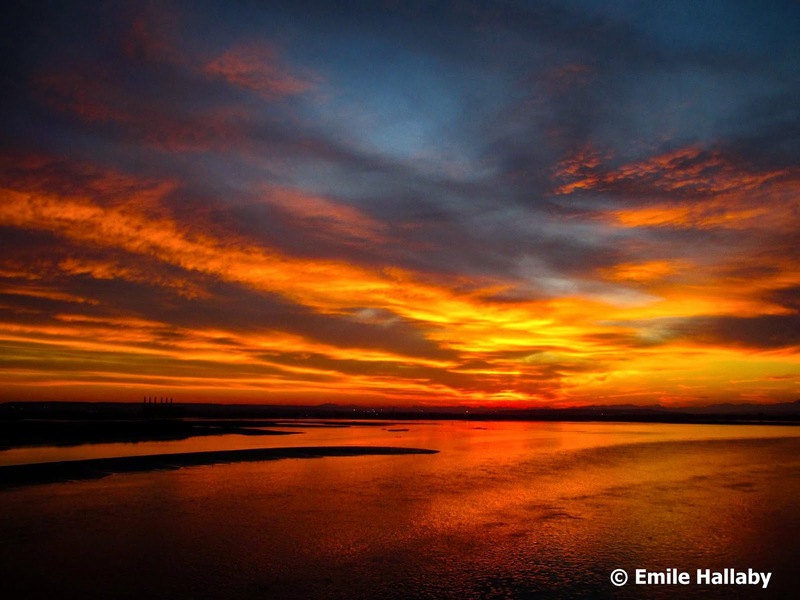 There is growing resistance amongst local residents and the general public to the over exploitation of natural resources which threatens the fragile ecological balance and the sustainability of the river. Last week two fellow travel bloggers, Dawn Jorgensen (The Incidental Tourist) and Di Brown (The Roaming Giraffe) came on a four night Sho't Left trip to the Eastern Cape which I was very privileged to play some part in. Unfortunately I was busy over the weekend otherwise I would have joined them on the trip. I did get to meet the two of them and show them around a little bot of Port Elizabeth though. 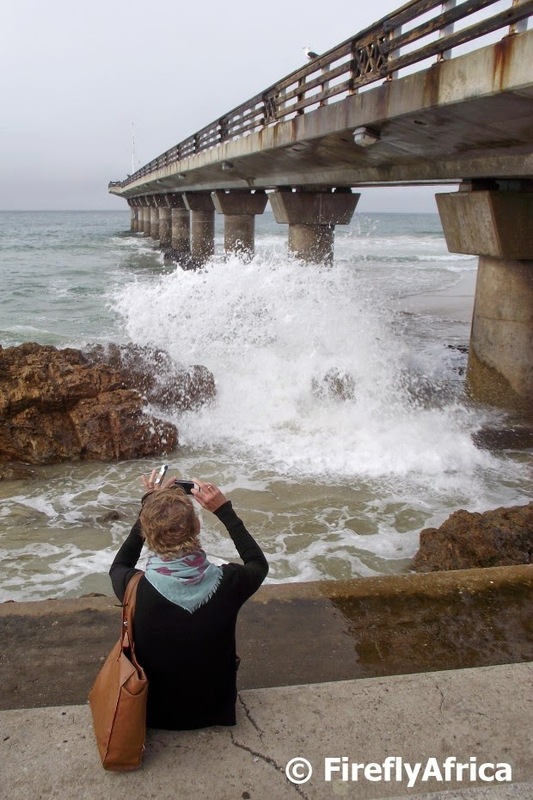 Here Dawn is getting a photo of Shark Rock Pier to place on Instagram. Check out their blogs in the weeks to come for some of their posts from the trip. This is the last post in this week's Sundays River Ferry series. After cruising down the river and climbing the dunes, this is the view you get of the river mouth. 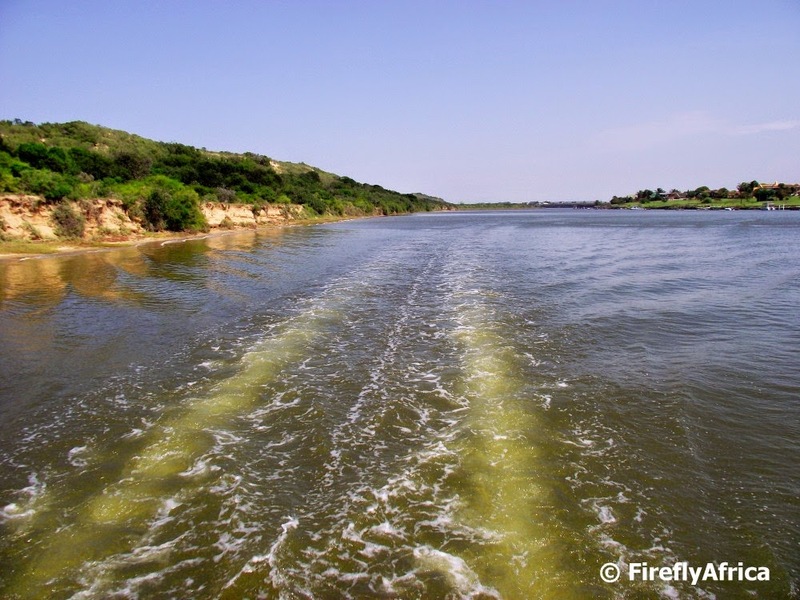 The Sundays River is said to be the fastest flowing river in South Africa. 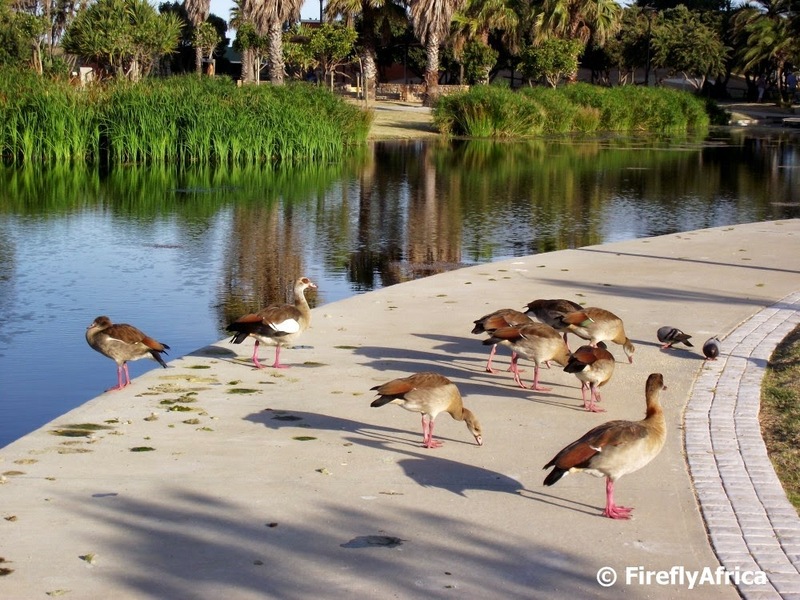 It was originally known as the Nukakamma (Grassy River) by the Khoisan because the river's banks are always green and grassy. 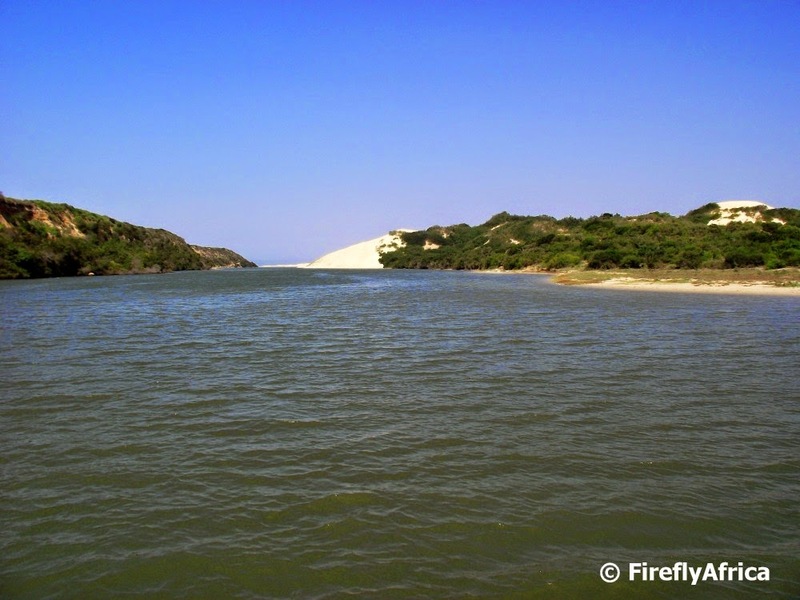 The river has it's source in the Compassberg mountains (the highest mountain in the Eastern Cape) near Nieu-Bethesda. From here it flows past Graaff-Reinet in a horse shoe, through the Karoo, the Zuurberg Mountains, past Kirkwood and Addo in the fertile Sundays River before getting to this point about 40km east of Port Elizabeth. The dunes at Colchester is part of the Alexandria dune field which is the biggest coastal dune field in the Southern Hemisphere and seriously high. 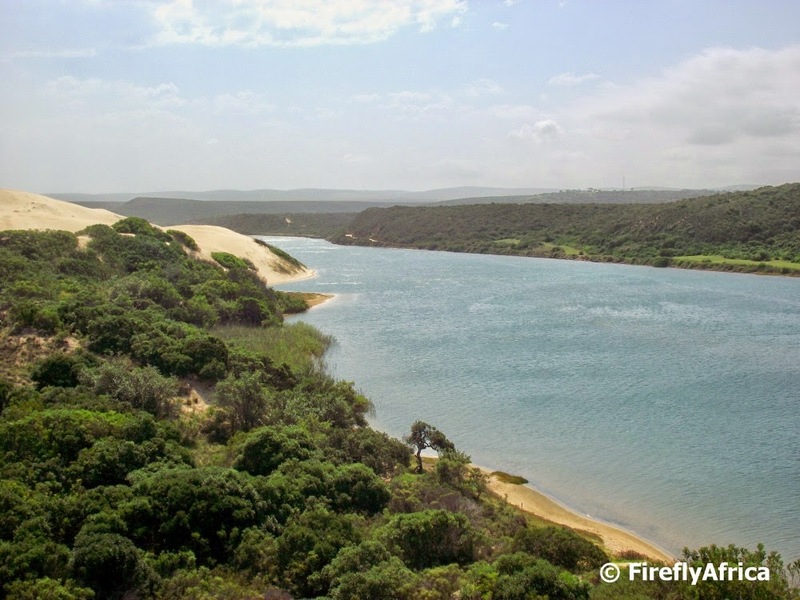 From the top of the dunes you get a fantastic 360 degrees view of the surrounding dunes, the river below all the way to the river mouth (picture to come tomorrow), Algoa Bay, St Croix Island and Port Elizabeth beyond. After huffing and puffing to the top the view makes all the effort worth it. And the best way down? 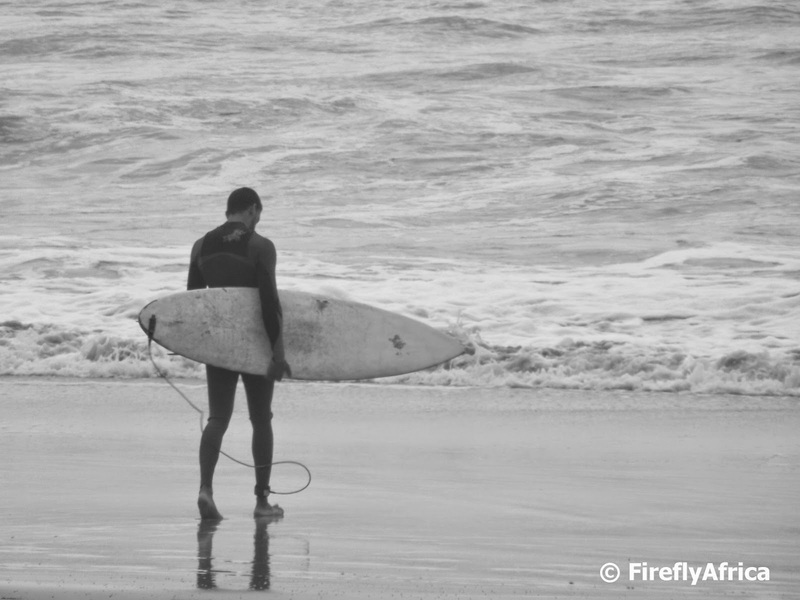 Either flat on your tummy on a dune board or running down like an elephant. You'll know what I mean once you've done it. This is post #5 in this week's Sundays River Ferry series. This is post #4 in this week's Sundays River Ferry series. After cruising upstream to the Mackay Bridge the cruise heads downstream towards the river mouth to climb the dunes. The river flows in a northerly direction with the villages of Cannonville and Colchester on the left hand side before turning east and seaward at Pearson Park. 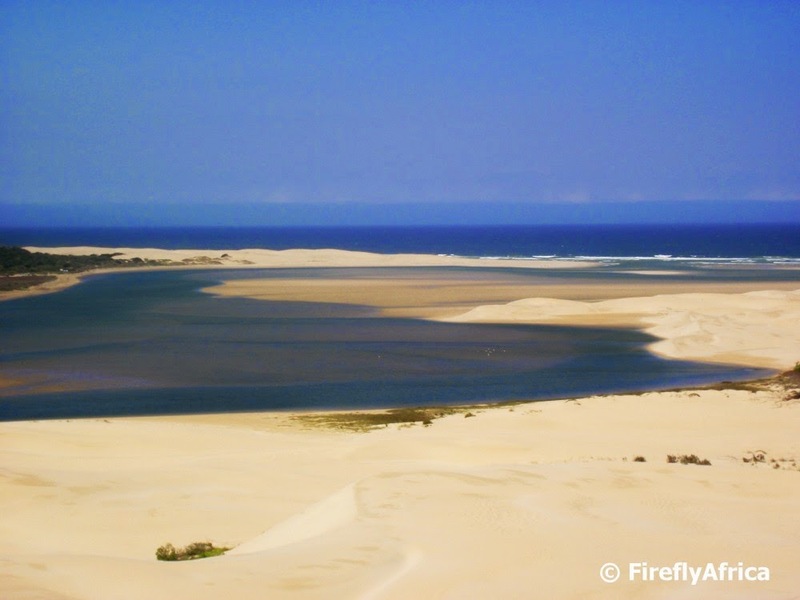 Looking down the river you can see the sand dunes waiting with the ocean beyond. 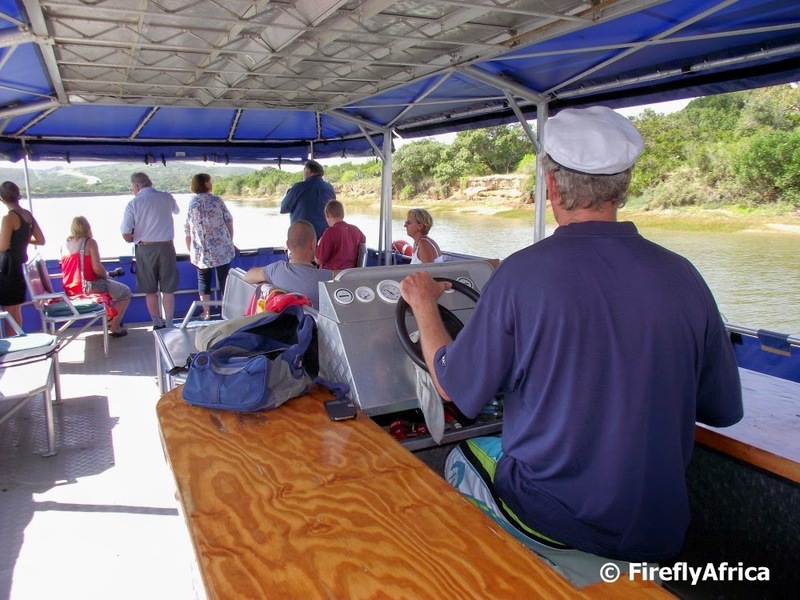 Today is post #3 in this week's series on the Sundays River Ferry. "Permission to come on board Captain?" Who would answer this question when you want to get onto the Sundays River Ferry? Darn, suddenly I want to sing... "Who lives in a pineapple under the sea?" This answer may be Sponge Bob Square-pants but that of the former would be Les Kingma. Les and partner Maggie Mann are the folk behind the Sundays River Ferry with Les expertly steering the ferry up and down the river and who's also the first to take off his shoes to climb the dunes at the downstream turning spot. If Maggie isn't busy with guests at their guesthouse in Cannonville then she'll join the cruise as tour guide, expertly entertaining guests and pointing out birds and other interesting facts along the cruise. This is the second post in this week's series about cruising on the Sundays River Ferry in Colchester. The cruise from the jetty first takes one upstream to the historic Mackay Bridge before heading downstream towards the Sundays River Mouth. Along the way you can see many of the different bird species found in the area, monkeys, jumping fish (like we did on this trip) and if you're lucky perhaps even a water monitor. These days marketing a destination is all about experiencing that destination rather than just going there. 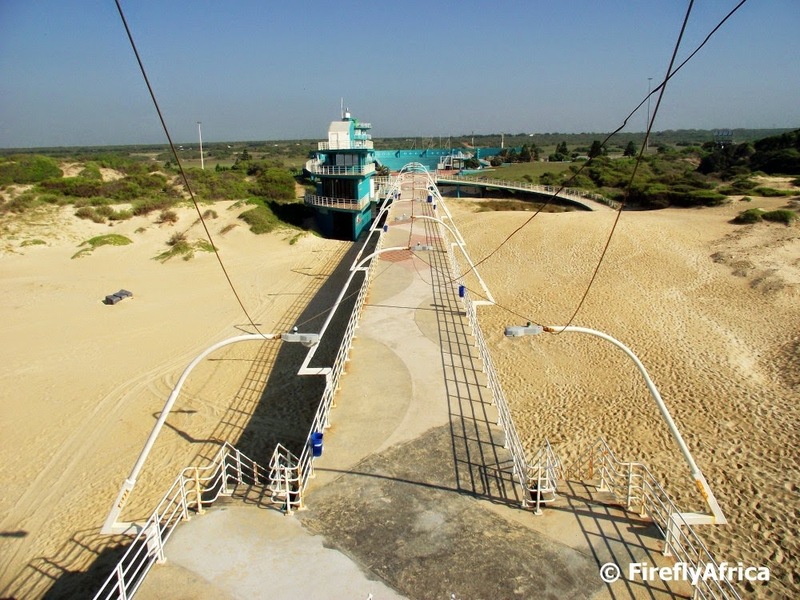 One of my favorite experiences around Port Elizabeth is cruising on the Sundays River Ferry and even though I have done some posts on it before, I have decided to do a series about it this week. 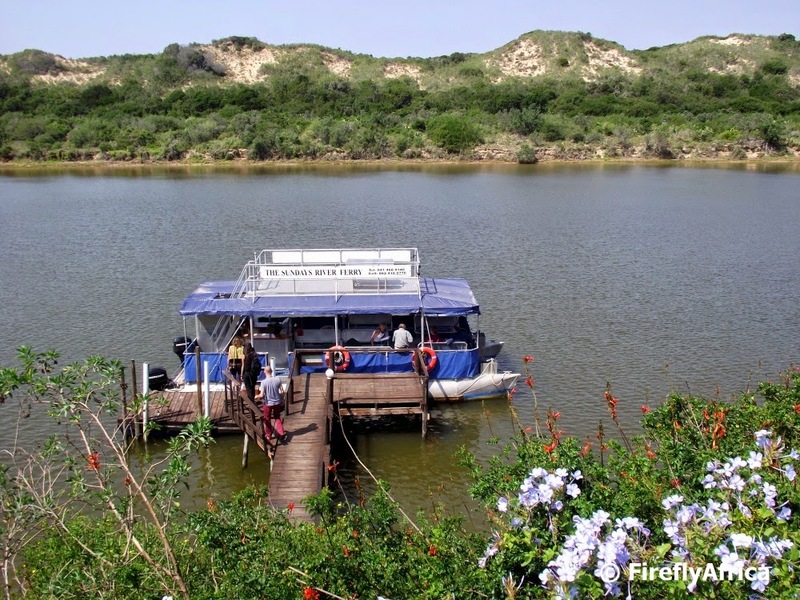 The photos used in the series were taken on a cruise I got to go on after a Addo Tourism meeting at Dungbeetle River Lodge a week or so ago. 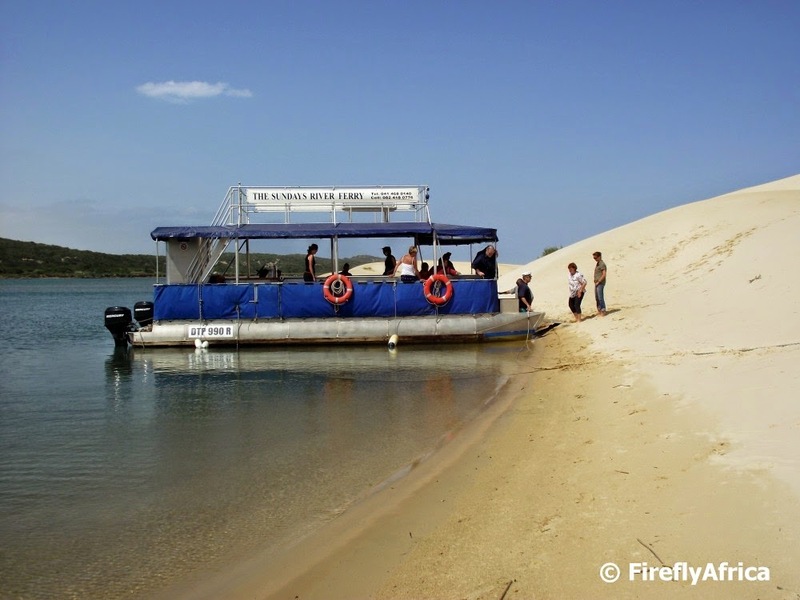 We start off the series with the passengers boarding the ferry at Dungbeetle's jetty. Driving back to the office from a meeting at the university I decided to stop at Pipe to see if there were any surfers out there. 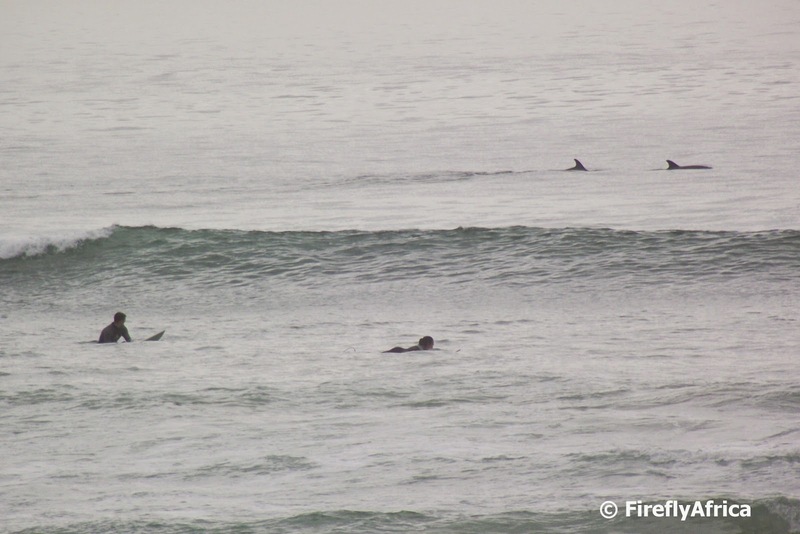 There weren't that many but those who were out catching a wave was joined by a couple dolphins swimming past. 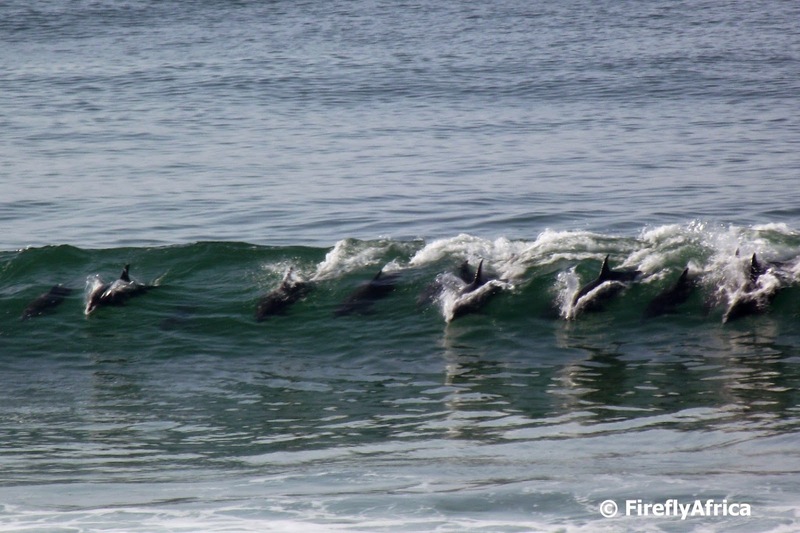 I bet a rookie surfer's heart would skip a beat if he had to spot a dolphin's fin behind a wave for the first time. There is nothing as cute as a mother duck, or in this case an Egyptian Goose, swimming or walking along with a couple of babies in tow. That was the case at the Kings Beach lake until babies started to turn into messy teenagers... This is not a negative post, just one making fun with the geese and what they leave behind them. 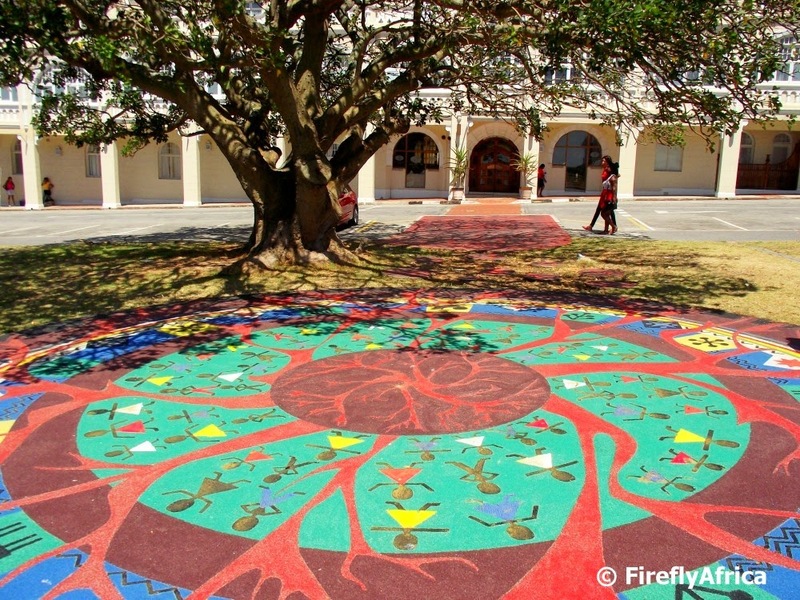 Following Route 67 up from Market Square towards the Donkin Reserve visitors would see a very interesting art piece just past St Mary's Cathedral. 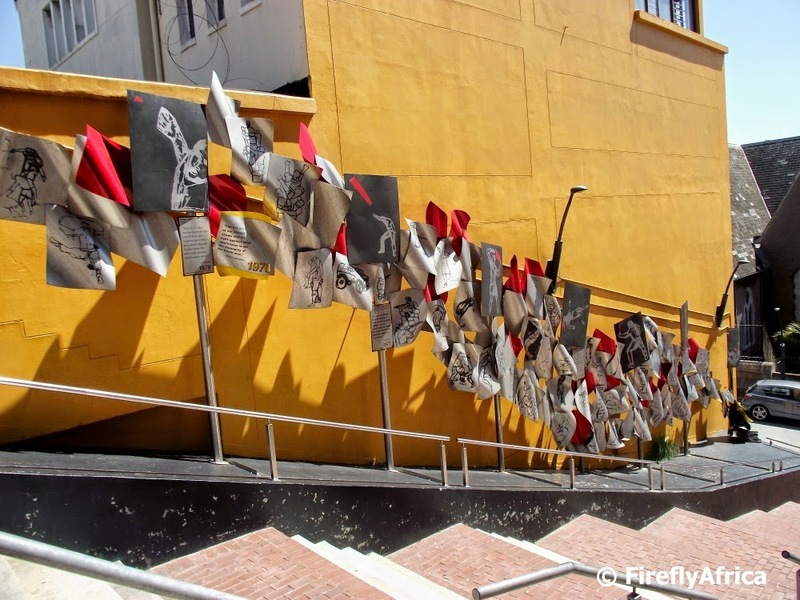 The 76 Youth piece was the result of a workshop collaboration and is a statement about the '76 generation and represents the spiritual journey undertaken by those who fought against oppression, specially those involved in the uprisings in the late 60's and 70's. 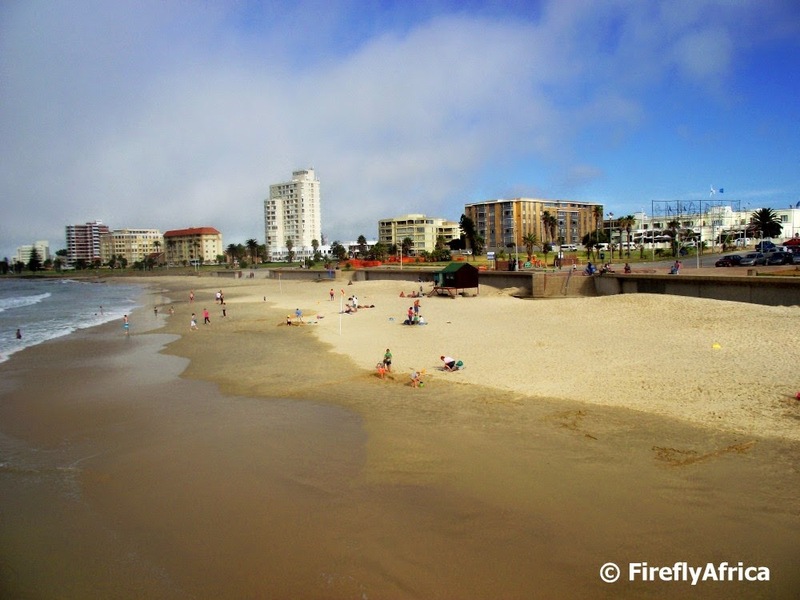 Today's post is slightly outside the borders of Nelson Mandela Bay, but the Gamtoos area is very much part of the metro even if its only through close association. When the first Dutch trekboers got to the Gamtoos River in the latter part of the 1700's, they had to move upstream to find a suitable spot to cross the river. Later a pontoon was used roughly where the Gamtoos Ferry Hotel is today. There was a call for a causeway to be erected and the present bridge on the old road was decided on. The bridge was completed and opened on the 3rd December 1895 at a cost of £20,000. 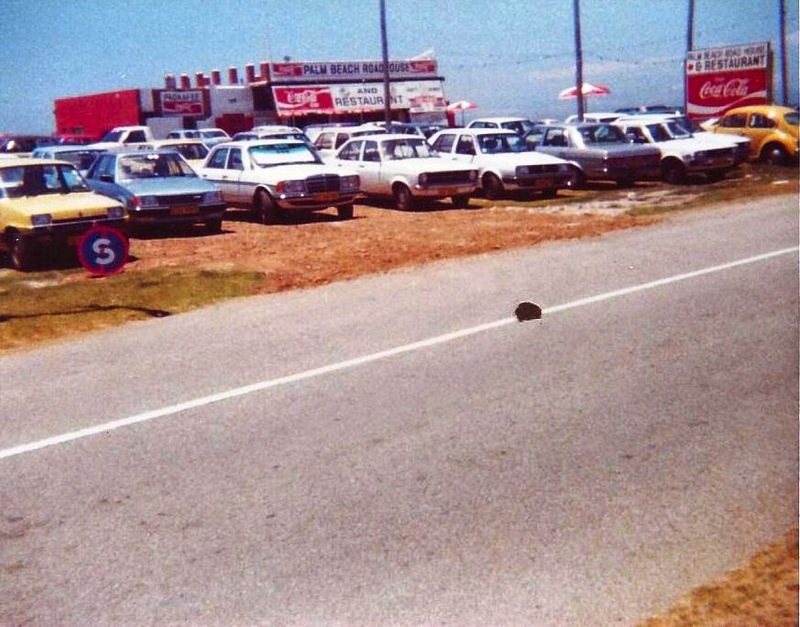 I love getting emails from followers of PE Daily Photo and The Firefly Photo Files, but it gets even better when I get mails like the one sent to me by Socratis "Socks" who was the last owner of the Palm Beach Roadhouse at Flat Rocks. He has sent me some pictures of the roadhouse to post and said he's got a couple of old newspaper clippings that he will scan and send me some time as well. Ahhhhh, the good ol' days of old fashioned roadhouses on the beachfront. Today this site is cleared and only occupied by a parking area. 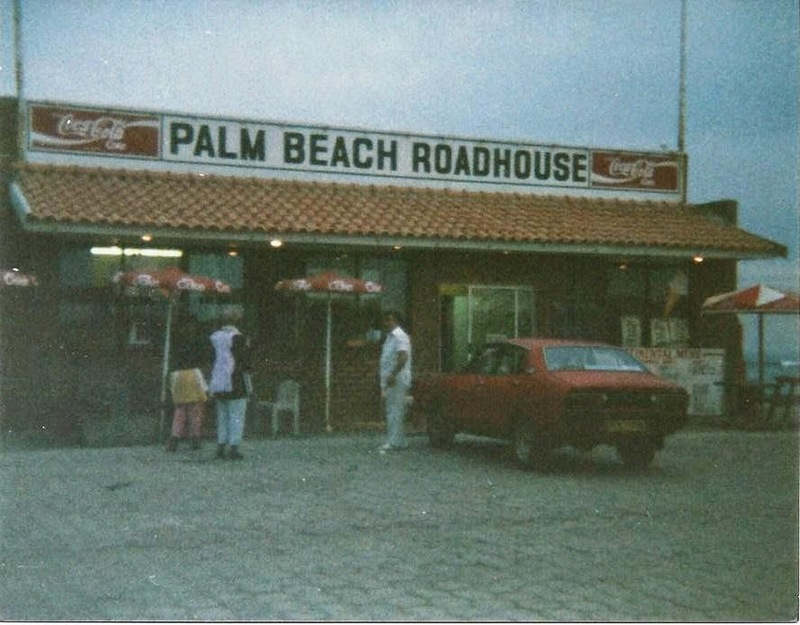 Do you have any good memories of the Palm Beach Roadhouse? 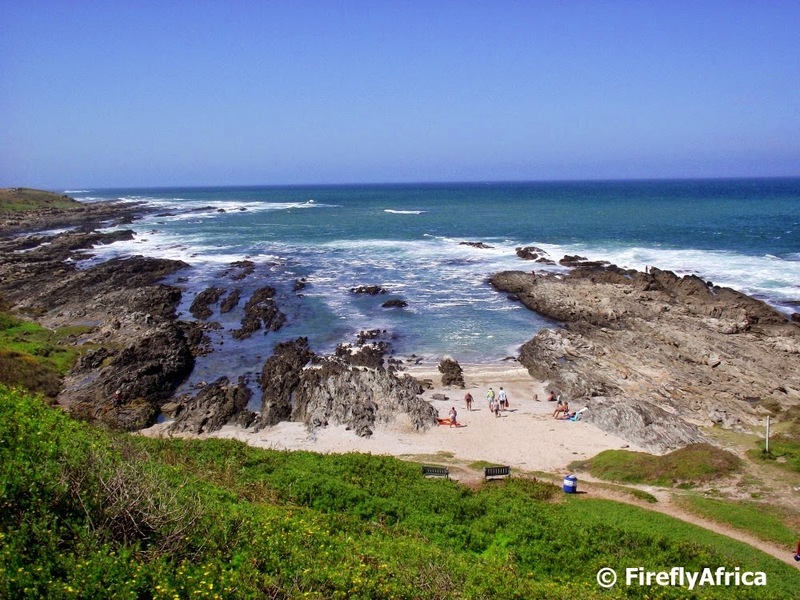 Most people enjoy Port Elizabeth's main beaches but there are the few who try to flee the crowds to their favorite hidden spots and the little "beaches" and gullies in Schoenmakerskop are amongst these. The most popular one in Schoenies is just in front of the Sacramento Restaurant and can be reached via steps down to the beach. The spot is called Tanks. According to Luc Hosten of Friends of Schoenmakerskop there are two theories on where the name came from. The first one is that apparently large water storage tanks once stood in the area to store water from the springs and the second one is that a tank washed up from a nearby shipwreck. There was a metal outlined shape at the mouth of the gully visible a few years ago - possibly from the shipwreck. Some people also call it Nuns Pool but according to Luc the purists would point out that Nun's Pool is to the right of Tanks. 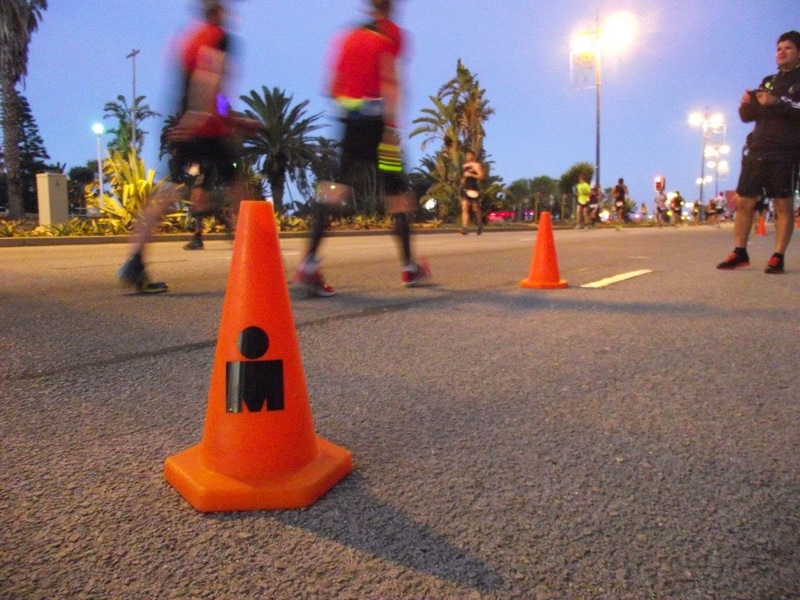 Ironman is probably the biggest event staged in Port Elizabeth and right up there to what the Argus cycle race is to Cape Town and the Comrades Marathon to Durban. But Ironman isn't just one day of ordinary sports men and women doing extra ordinary things, its a whole weekend of awesomeness and this past weekend was Ironman weekend. It all starts in the week before the event with the arrival of athletes and there families, the Ironman expo and registration. Friday afternoon is the start of the weekend's events with Iron Girl, a ladies only 10k run. This is followed by the Corporate Challenge (called by the competitors as Corporate Ironman), a relay event over 1/10th of the full Ironman distance, on the Saturday morning and Ironkids on the Saturday afternoon. Yesterday morning at 6:30 the pro's started off a long day on the road by heading into the surf at Hobie Beach for a 3,8km swim that took them down to Kings Beach and back. By the time the rest of the field hit the water at 7am the top dogs were well on their way back to Hobie already for the transition to the 180km cycle. The cycle route took them through Port Elizabeth out via Lake Farm to Maitlands and back via Seaview Road and Marine Drive to the beachfront... times 2. As if this isn't enough already, it is followed by a three lap run along the beachfront totaling 42,2km, or a full marathon. One can't help but to take your hat off to these guys and galls. We spent some time in the morning next to Buffelsfontein Road to encourage the cyclists going past and then headed down to Marine Drive across from MacArthur's Pool in the evening to watch the runners. A run that is said to be the best supported amongst all the Ironman competitions in the world. These competitors, a few who I know, really inspires one to get off your backside and get active. I'm not saying I'm going to do Ironman soon, but I will be going for a run around the block. This Grey Heron was taking a break on a pole in the Sundays River at Colchester and wasn't really bothered when we cruised past it on the Sundays River Ferry. The Grey Heron (Ardea cinerea), is a wading bird of the heron family Ardeidae and grows to about one meter in height with a wingspan of between 1,5 and 2 meters. It normally feeds in shallow water, catching fish, frogs and insects with its long bill. Herons will also take small mammals like mice and rats as well as reptiles. It will often wait motionless for prey, or slowly stalk its victim. When the Apple Express used to run (and lets hope it will be running again some time) it always stopped at the Van Stadens Railway Bridge to allow passengers to walk across the bridge if they wanted to get photos of the train crossing it. I decided to drive out to Van Stadens to look for two Geocaches at the bridge and got to visit it for the first time in over ten years. 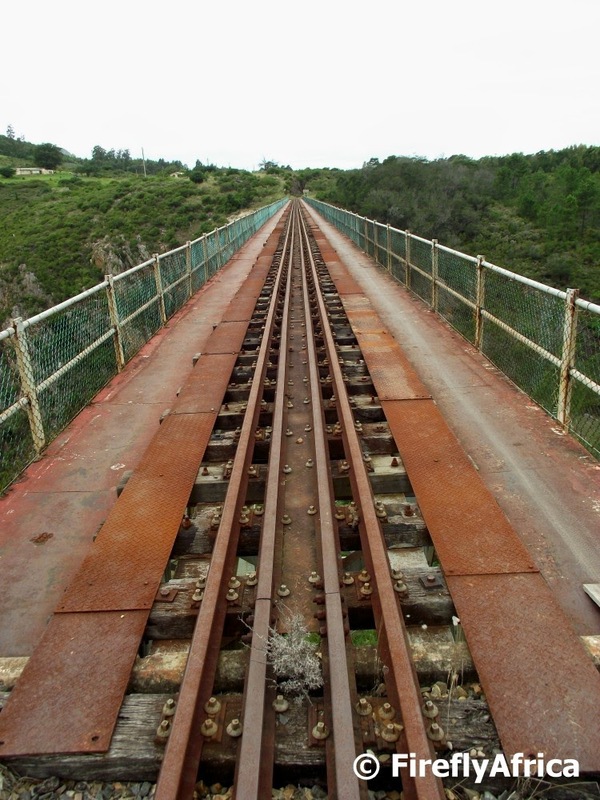 The Van Stadens Railway Bridge is the second highest railway bridge in South Africa and the highest narrow gauge bridge in the world. Construction on the bridge was completed in 1905. The bridge is 156 meters in length and 77 meters high. 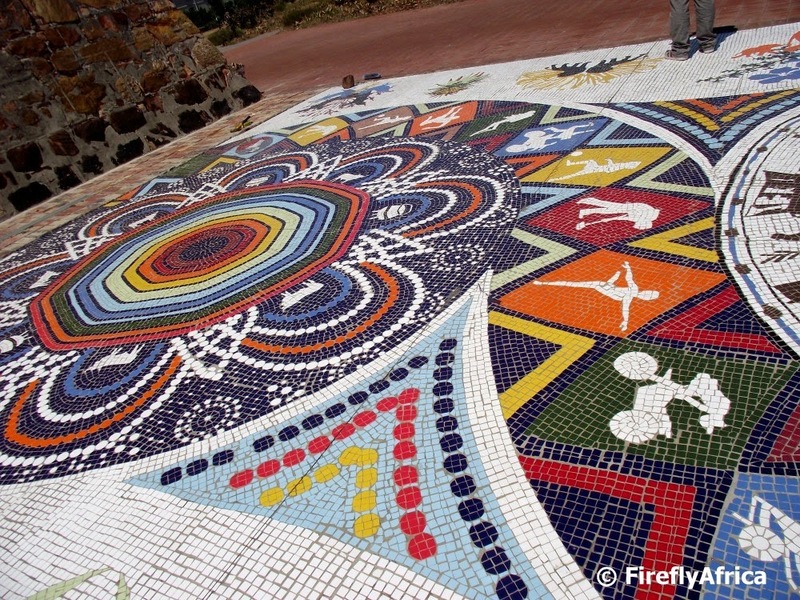 If creating the 470 m2 Piazza Mosaic as part of Route 67 did one thing it was bringing vibrant colours to the Donkin Reserve. The mosaic has so many different pictures and figures that I literally see something new every time I visit the Donkin. One of the great things about it is the different angles you can look at it. Either close up or from a distance with the third option being from the top of the Donkin Lighthouse.